This year’s Chamber of Commerce Duck Race Festival promises to be one of the busiest yet. 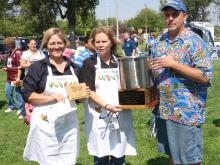 KSCB’s Chili Cookoff is from 11:30 a.m. to 1 p.m. B107.5 will broadcast live from the event from 11 a.m to 1 p.m. Here is the schedule. 11 a.m.-1 p.m. Water Fight with city and county fire departments.